Easy and cost-effective way to start with automation. With our package, you can start using our robot and earning money in less than 1 hour. Average set-up reported by customers - only half a day. Fast set-up. Unpack, mount and program the first simple task in less than an hour. The drive to move up from a micro-enterprise to being a medium-sized enterprise and further, along with increased productivity and precision led SMEW Textile Machinery Pvt. Ltd. to choose Universal Robots cobots for their textile machine manufacturing. SMEW has improved its output by 300% within a year of deployment. Linaset implemented UR5 solution. It helped to improve productivity, efficiency in supply usage and met customer's demand. Staff members energy were relieved from an energy-consuming task in production. Now Linset working on implementing the next robots. Paradigm Electronics is a Canadian manufacturer of high-performance loudspeakers and subwoofers. 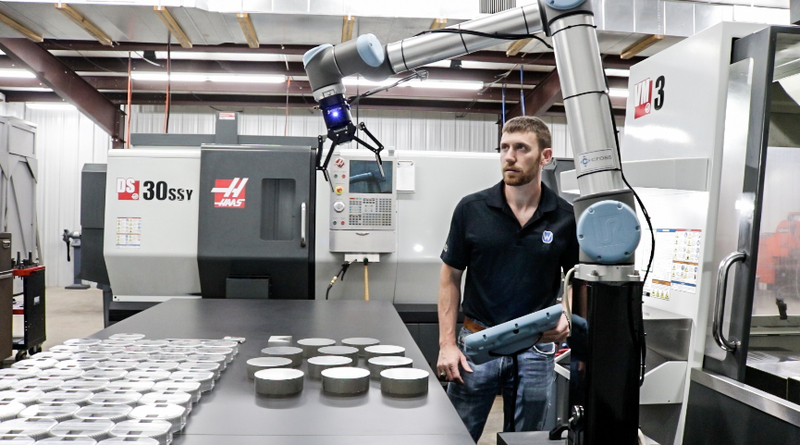 As a result of implementing a UR10 collaborative robot in polishing, a 50% increase in production achieved and the work environment for workers improved. Easy to use and programming lets operators with no programming experience quickly set up and operate UR robots. Innovative force-sensing technology enables the robot to stop operating if it comes into contact with an employee. Eighty percent of the thousands of Universal Robots worldwide operate with no safety guarding (after risk assessment), right beside human operators.